In Florida’s generally temperate climate, many plants provide fall and winter color. Florida’s fall and winter blooming plants come in a variety of sizes, colors, and growing habits. Some plants that wilt in the summer heat grow well in Florida’s mild winters. Sweet William, one variety of dianthus, produces solid or multicolored blooms and varies in height from 5 to 24 inches. Cold tolerant to USDA Zone 4, Sweet William produces flowers even in Florida’s coldest areas. Violas tolerate cool temperatures, come in a variety of both solid and multicolored forms, and bloom fall through spring in the south. Grow them from seed or transplant nursery seedlings. Zinnias produce flowers in a variety of colors and sizes. Zinnias love full sun, grow 6 to 36 inches high, and attract wildlife. Beach sunflowers produce yellow flowers and have a trailing habit. This sun-loving groundcover grows 12 to 24 inches high. Its high salt tolerance makes it ideal for beachside use. Dwarf lantana produces small yellow flowers, prefers full sun and grows 8 inches high. Lantana works well in mass plantings, tree surrounds or borders. Trailing lantana produces lavender flowers. This spreading sun lover grows 18 to 24 inches high and will cascade down a stone wall or from a hanging basket. Mexican heather produces white, pink or purple flowers. This perennial prefers full sun and can reach a mature size of 12 to 24 inches high by 24 to 36 inches wide. It works well as a border or in a mass planting, and attracts butterflies. Pentas produce white, pink, red or lilac flowers year round in the southern half of Florida and during fall in the northern part of the state. This sun loving plant reaches from 2 to 4 feet high and attracts wildlife. The penta's height makes it a good background plant. A Florida winter garden favorite, impatiens produce flowers in a variety of colors year round, grow best in partial shade and can reach 12 inches high. Impatiens attract butterflies. The camellia bush produces flowers in a variety of colors in fall and winter. Camellias prefer partial shade and can reach 12 feet high. The bleeding heart vine produces red and white flowers from spring through fall and grows best in partial shade, according to Flowering Vines of Florida by Sydney P. Brown and Gary W. Knox. 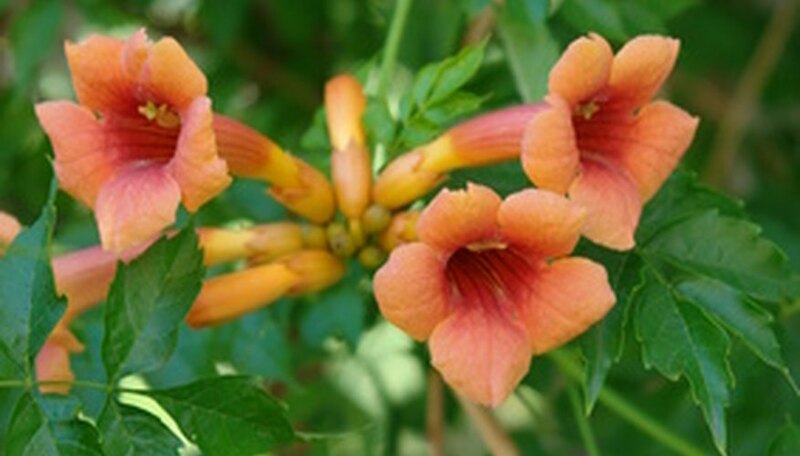 The cape honeysuckle vine produces reddish orange flowers year-round, tolerates sun to partial shade, and blooms during fall and winter in Central and South Florida. Climbing roses come in a variety of colors and fragrances. This sun-loving favorite blooms from summer through fall. Attract butterflies with the pipevine, which produces purple and white flowers from summer through winter and prefers partial shade.